one scoop! two scoops! three scoops! Ingredients: 0.22lb or 100g Ground Pork, 1/8 teaspoon, 1 teaspoon soy sauce, 1/2 tablespoon cooking alcohol, 1/2 teaspoon or less sugar, little bit of black pepper, 1/2 teaspoon chicken stock, 1 teaspoon hot water, 1 teaspoon sesame oil, 1/4 onion (minced), 2 teaspoon/1 teaspoon potato starch, 1 mushroom, and 2 sheets or 0.22lb or 100g cabbage. Preparation: 1. Shred the cabbage, sprinkle the starch. 2. Mix the hot water with chicken stock and let it blend together. 3. Wet the minced onion and wrap it in a sheet of cooking paper, put it in the microwave for 3 min (600 W). 4. Separate the mushroom stem and cap, cut the cap in about 0.40 inches square shaped. 5. Sprinkle the starch on the minced onion. Cook: 1. Put the ground pork and salt in a bowl, mix it until it is sticky, add the soy sauce, cooking alcohol, sugar, black pepper, and chicken stock, mix it well together. (Note: for the meat to become sticky, stir the meat in circles/throw the ball of meat back and forth into the bowl.) 2. Add the sesame oil, sprinkled starch minced onion, and mushroom and mix well together. 3. Separate the meat into 1/8, adding the cabbage around the ball of meat, make it round so it will stick. 4. In a heat-resistant plate, put a wet paper towel and add #3 on top, add another sheet of wet paper towel on top of #3, put it in the microwave for 5 min (600 W). 5. 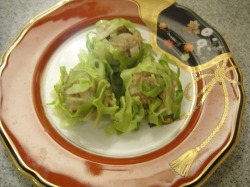 Serve the cabbage shumai on little plates. This morning my mom asked me, "So... what are you making for dinner tonight? I am going to make mapo-tofu." Since we were having a chinese dinner, I figured I might as well find a recipe on a chinese dish. After looking at many recipes online, cabbage shumai was the only one that looked good. When I told my mom what I was going to make, the first thing she said was "Shumai? Isn't that fattening?" AHHH!!! HEALTH FREAKS!!! LOL... I do agree with her though, because the meat in the shumai is covered with thick dumpling skin. Shumai is a chinese dish, however, Cabbage shumai is a Chinese Japanese dish. Instead of using dumpling skins to wrap the meat, cabbage is used. FYI: just use spicy sauce if you want to dip the shumai into something to have a stronger taste. For next time: 1. Cut the cabbage in thinner strips. The thicker the strips are, the harder it is for the cabbage to stick to the meat. 2. If shredding the cabbage by knife, roll the cabbage like a spring role. Makes the cutting process so much faster.